In a world where everyone seems to be going insane, nostalgia for simpler times is high. This Thanksgiving weekend an entire generation of hysterical Millennials got to look back 20 years to a staple of their coming of age in the 1990s. 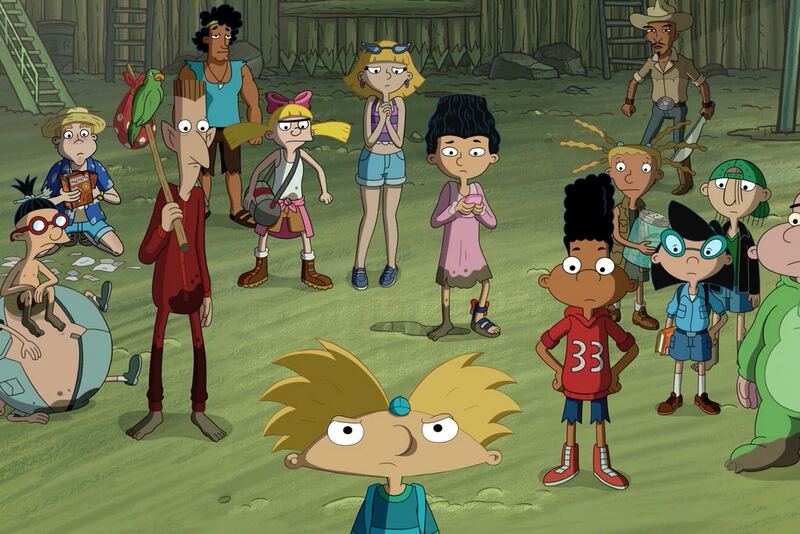 That throwback came in the form of the long-awaited and highly anticipated Hey Arnold: The Jungle Movie. Hey Arnold infamously ended on a cliffhanger almost 15 years ago. After the bust of the theatrical release of the first movie in 2002, the intended second movie (Hey Arnold: The Jungle Movie), which would solve the series’ long-running plot lines, was dropped from production, and the series lingered essentially unfinished. As “the Godfather of Influence,” Robert Cialdini, tells us, people don’t like unfinished things, especially a show that was a classic to an entire generation of children. So when those children came of age, they demanded that the movie be made. If social media can make an “impossible election” happen, it can produce a new movie for a children’s network on TV, and the campaign was successful. Hey Arnold: The Jungle Movie finally premiered yesterday, right in the middle of Thanksgiving weekend for an optimal time. Hey Arnold is a series based on subtlety in many ways. The stories aren’t grandiose. They deal with relationships and everyday issues, managing to turn them sometimes into an exaggerated catastrophe that nevertheless gives you the hint of the stress they cause. The dysfunction of Helga’s family is the most obvious of these, and the things you missed as a child become glaringly obvious as an adult, like her mother’s alcoholism. Helga’s situation, at least with regards to her family, is one thing that isn’t resolved or even addressed in Hey Arnold: The Jungle Movie. In fact, it seems to have grown worse. The lack of a real exploration of this was one of the movie’s flaws, but with a two hour run time, there’s only so much you can do, so I get why the main focus was where it was. You just got the feeling that there was a lot more under the surface that could have been explored, with Helga in particular (who, rarely, had her sister Olga with her through The Jungle Movie), but with everyone else too. As you could guess by now, the main story in Hey Arnold: The Jungle Movie centered around the title character. Specifically, he was on a quest to find his parents, who had been missing for almost 10 years, or pretty much Arnold’s entire life. In what could be mocked as do-gooder altruism coming back to haunt you, Arnold’s parents went to the fictitious Central American country of San Lorenzo to deliver some medication to an indigenous people, called the Green Eyes, infected with a mysterious illness called the Sleeping Sickness. They weren’t seen again, and the original series ended when Arnold found his father’s journal with a map of their travels on it. The last we see is an excited Arnold informing his grandparents of what he found. A year later, there seemed to be a contest where the winner would get to go to San Lorenzo. To make a long story short, Arnold won it, finally letting him make the trip to the place where his parents disappeared. Yet, not all was as it seemed. To make another long story short, Arnold and his class met up with a man who was supposed to be his parents’ old friend Eduardo. Following an attack by what seemed to be river pirates led by the notorious La Sombra, who was an antagonist of his parents, Arnold and his classmates took a long hike to their destination. It was there that they learned the shocking truth – “Eduardo” was actually none other than La Sombra in disguise, he’d concocted the entire contest from the start to lure his prey to San Lorenzo, and he declared that they were all his prisoners. La Sombra’s machinations reminded me a lot of Palpatine in Absolute Power. He baited Arnold with a contest because he knew the prospect of finding his parents in San Lorenzo was too much for him to ignore, and he allowed himself to be deceived at every other step of the way. I must say that La Sombra was the real star of The Jungle Movie. He was built up as the perfect villain. Even the scene of his demise had me drawing parallels with Emperor Palpatine – the facial disfigurement, the maddening desire for power and treasure above all else, the frenzy of a fight he put up. Even the way he died was perfect. La Sombra planned all the way to the end alright…he just couldn’t see that the end had something he hadn’t planned for, and his impatience and greed cost him. Cicero wins again. As fun as seeing Hey Arnold: The Jungle Movie was, it was also a reminder that I’m long past being a kid, which is still taking some getting used to. A lot of the things in the movie just seemed so nonsensical, particularly for a relatively realistic cartoon like Hey Arnold. The jinxed kid Eugene blew up literally like a balloon after eating something and had to be rolled in order for him to move. La Sombra and his river pirates only used machetes and had no guns, when actual river pirates would have probably shot one of Arnold’s friends to get him to cooperate and raped Olga 50 times for good measure. If you’re reminded of that scene from Rambo (2008), that’s what I was thinking about. Of course, this wasn’t possible to portray in a movie like this. That’s the point. So many years have passed between now and when I was a kid watching Hey Arnold that what wouldn’t have dawned on me back then does now. It’s a medium made for a more innocent mind. That was made clearer when we saw a whole batch of totally unrealistic scenarios toward the end of the movie – Arnold’s parents and every other adult in the Green Eyes’ hidden city asleep for 10 years but otherwise fine, the cure to the disease being there but requiring a certain “chosen one” (you know who) to open a treasure to spread it, the fact that there could even be such thing as a hidden city above ground in the age of satellites, etc. But I suppose that’s the point. What’s unrealistic to me is perfectly fine for a new kid discovering the show on a kid’s network. Suspension of disbelief is easier to do at that age. If this was an attempt to please the generation that grew up with it and introduce a new one to the show, The Jungle Movie did a fine enough job. “Fine enough” implies that there was something to be desired. I mentioned a few of those things, but the biggest one was that the payoff at the end, when Arnold reunited with his parents at long last, fell a little flat. It wasn’t the experience you think it could have been and felt a little rushed. In comparison, the end of the arc of Helga’s unrequited love was far better, with her infamous Arnold locket playing a decisive role. The grand entrance of Arnold’s parents was far emptier. Maybe that was the point, since Arnold hasn’t exactly established a relationship with them that he can remember, but it felt like it could have been so much more. Perhaps that was by design, as there is talk of a revival series on the way following The Jungle Movie, which would obviously explore the fallout. I have no opinion on this. Perhaps the wave of nostalgia and the comparisons it brings between childhood and adulthood has already been adequately explored for me. To not end your stories on a flat note, read Stumped, because it tells you exactly how to take advantage of the way people prioritize endings.